Tensions are running high as the townsfolk of Eden aren't too happy with the current change in leadership. A revolt is brewing. Is Mark strong enough to push back against the opposition? Meanwhile, Agent Bremble might finally get an audience with the man he's been after but will it pay off? 'Postal' has been building up the reveal of Eden's founder and Shiffron patriarch, Isaac. He's been mostly a boogeyman, a mythical figure spoken about in the most horrific sense. Isaac Goodhart gives him a presence despite being much older, heavily bearded, and using a cane. His conference with the much younger and cockier Bremble goes surprisingly calm but like any good Shiffron knows, manipulation is as effective as brute force. Goodhart's juxtaposition of these two opponents is stark in their physical appearance but it's clear through Bryan Hill's dialogue that Shiffron is spinning quite a web. The younger Shiffron, Mark, shows he has a little of his father in him. Molly continues to be an irresistible force that draws Mark in, playing to her whims. However, he shows he knows exactly what he's doing. It's even more evident when disgruntled Eden-ites disguised in masks come knocking at his door. Mark steps up in ways that clearly demonstrate his growth, revealing he knows how to play this game as only a Shiffron can. If this was a mafia story Mark would be becoming a made man. Goodhart and colorist K. Michael Russell create such a great layout that just flows from one scene to the next. Russell's colors are deep and dark matching the tone of the story. Goodhart is so good you don't really think about the art as you read it because you're sucked in. Hill and the artists are in perfect sync as each scene carries so much weight that you're riveted by everything on the page. 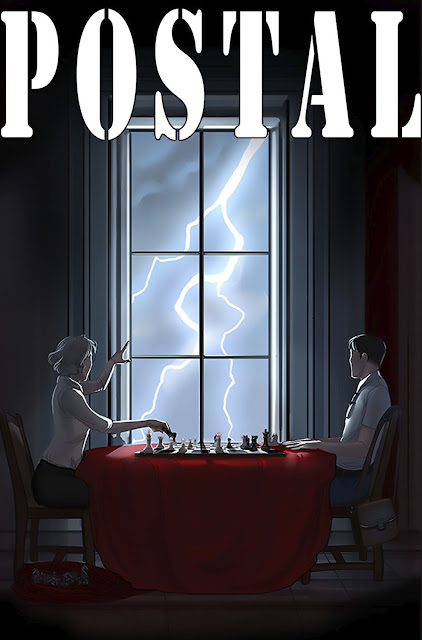 'Postal' is on such a groove right now. It's one of the most engrossing dramas in print and the build-up is beginning to pay off. Hill is playing chess, manuevering his pieces into place while further developing characters like Mark. This is top-notch writing and art that makes comics so worthwhile.